Mayas is a pianist living in Berlin. Her musical vocabulary utilizes both the inside as well as the exterior parts of the piano. With preparations and objects, she creates textural, linear, and fast moving sound collage. Alongside the piano, she has performed on a Clavinet/Pianet: an electric piano from the 60s with strings and metal chimes. She performs internationally solo and in collaboration with a large number of musicians and composers. Current projects are Spill, a duo with drummer Tony Buck; a duo with Christine Abdelnour (sax); and Great Waitress, a trio with Monika Brooks (acc) and Laura Altman (cl). She is currently pursuing PhD studies at the University of Gothenburg, Sweden and investigating extended instrumental techniques, spectral music, and psychoacoustics in an improvised music context. Since 2013, she has been producing radio pieces for ABC Australia and Deutschlandradio Kultur, and has released 20 CDs to date. 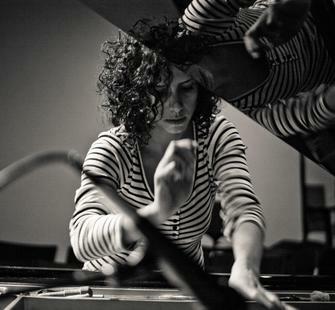 She has performed and toured in Europe, the United States, Australia, Mexico, and Lebanon, and collaborated with many leading figures in improvisation and composers such as John Butcher, Andy Moor, and Axel Dörner, among others. She has performed at festivals and exhibitions such as MaerzMusik (2012, 2015), dOCUMENTA (2012), and the Berlin Biennale (2014). Read more at magdamayas.jimdo.com.